Join us for a beautiful yet challenging ride, taking in three mountain ranges and some stunning coastal riding. We'll climb mountain passes, speed along clifftop roads, and swoop past lakes on thrilling descents. This challenge is not for the faint-hearted, but with the right training, and with our event support, you will be sure to make it successfully to Cardiff, having crossed a country in the space of 3 incredible days! Upon leaving Llandudno we'll have a gentle warmup along the North Wales seafront cycle path, including a lap of the iconic Great Orme, making sure our legs are up-to-speed before tackling the first proper climb of the trip; the beautiful Llanberis pass. After conquering this classic ascent through the centre of Snowdonia National Park, we'll then drop down to west coast, passing through scenic seaside towns to finish our first day's riding in the tourist village of Barmouth, right on the Mawddach Estuary, considered one of the most beautiful places in the whole of the UK. 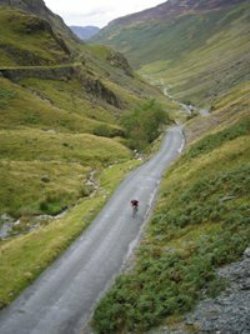 Day two sees us climbing up and over the Cambrian mountains, including taking in the infamous Machynlleth Mountain Road, the view from the top is said to be one of the best in Wales, which more than makes up for the lung-busting climb to get there! After dropping down past Llyn Clywedog, we'll roll through the Cambrian foothills to the historic spa town of Llandrindod Wells for our night's accommodation. Our final day sees us finishing in central Cardiff, but only after crossing our final mountain range; the Brecon Beacons. The second half of the day is a long gradual descent back to sea level, where we'll have a well-earned meal to celebrate your completing of an incredible challenge; the crossing of a country all in a long weekend! 08:30 Meet your event challenge team for safety briefing. 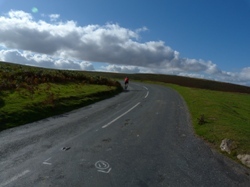 Ride Highlight - Machynlleth mountain road followed by little-used mid-Wales back lanes. Ride Highlights - Brecon Beacons traverse followed by long descent to Cardiff. We will be staying in comfortable hotel accommodation in twin rooms. A limited number of single room supplements may be available on a first come first serve basis. Non EU passport holders should seek travel advice. - 2 nights bed and breakfast accommodation (Barmouth and Llandrindod Wells). - 2 evening meals (Barmouth and Llandrindod Wells). - 3 picnic style lunches. - Snacks and water on ride days. - Experienced cycle leader with the group at all times. - Support vehicle with mechanical and first aid support, including spare bikes. - Pre-event accommodation in Llandudno. - Post-event accommodation in Cardiff. - Evening meal in Cardiff. - Transfers to/from the start/finish. Please have your bike fully serviced before this event. Headphones whilst cycling will not be permitted. We can hope for clear calm weather for this trip. However as with any UK based challenge we should still come prepared for the worst, especially on the mountain passes. - Single room (subject to availability, extra charge applicable).